How do I know if I can apply for citizenship? Depending on your situation, you may be eligible to apply for U.S. citizenship, also known as naturalization. A detailed list of basic requirements to become a U.S. citizen can be found on our Eligibility page. Why should I apply to become a U.S. citizen? There are many reasons that people decide to become U.S. citizens, but one of the most important is that becoming a U.S. citizen allows you to vote and influence the direction of the country. Another reason to become a U.S. citizen is because the naturalization of a parent may allow a child under 18 years old who has a green card to become a U.S. citizen automatically. Other reasons people naturalize are to make travel easier, make it possible to bring more family members to the U.S., be able to work in jobs that require U.S. citizenship and live without fear of possible deportation. Can I apply for citizenship before I have had my green card for 5 years? Yes, you can apply for citizenship 90 days before having your green card for 5 years or 3 years if you’re married to a U.S. citizen. When is the next SF Pathways to Citizenship workshop? Check out our calendar of events to view a list of upcoming large, group processing workshops as well as upcoming dates for smaller, computer-based workshops. You can also email us at info@sfcitizenship.org for additional questions or information. How can I sign up, as a participant, to attend the workshop? If you are attending one of our large group processing workshops, you don’t have to sign up! Just arrive at the designated workshop location before 12:30pm, when registration closes. If you meet the eligibility requirements, you will be registered and begin the workshop process. Arrive early to avoid long waits, as these workshops have a high turnout rate and participants are helped on a first-come first-served basis. If you are interesting in attending one of our smaller library workshops, visit the Library Workshop page to learn more about how to register. I have been told that I do not meet the eligibility requirements for citizenship but would like to try attending this workshop anyway. What should I do? We encourage you to review the edibility requirement here. These workshops are intended for applicants who are ready for immediate filing – if you need help, please schedule an appointment with our immigration service provider partner organizations. 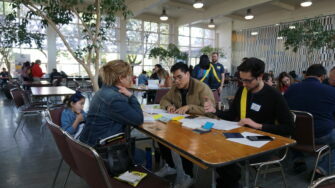 How can I volunteer with SF Pathways to Citizenship? Your interest in volunteering with us is greatly appreciated! Learn more about how to volunteer on the Get Involved section of our site. No. Our workshop policy requires that the individual applying for citizenship is physically present at our workshop. If I don’t live in San Francisco, can I still attend one these workshops? Yes! We recommend arriving early and prepared with the necessary documents and information. Why do I need to return my participant packet? What will happen to my personal information? Your participant packet, which is used exclusively at our workshops,, is retained by nonprofit partners, kept confidential, and used to measure impact and conduct follow up with participants. We keep your contact information so we can contact you, should you leave any important documents or items behind at our workshop. Do I have to pay the application fee at the workshop? No. In fact, you may qualify for other forms of financial support for your application. We will walk you through your options at the workshop. Otherwise, it is your responsibility to submit your application with a check or money order to USCIS. What if I don’t hear back from USCIS after submitting my application? This is why you should send certified, secure mail with delivery confirmation so you can track your application. If you haven’t heard back, please contact USCIS national customer service line at 1 (800) 375-5283.